City Barcelona woos you. Are you ready to be wooed?. City Barcelona reveals much more than people can describe. The city wraps you warmly with its warmth. Barcelona offers you an array of anxiously astounding amazements. The city melts in the layers of Catalan culture displaying architecture decorative and designed deliciously by distinguished artists. Barcelona is honorable host to many heritage buildings. Barcelona is boastful of its bold as well as bewitching landmarks. One is simply baffled. In it live seas of great monuments, museums, buildings, parks, squares displaying Barcelona's beauty at large. Eixample, Barrio Gothic, El Raval, Placa Espanya, Casa Batllo, Basilica of Sagrada Familia, Camp Nou, iconically incredible Las Ramblas, Palao Guell, Montjuic Castle, mesmerizing Magic Fountain and a long catalogue of captive sites wait to meet your eager eye. Barcelona welcomes you to visit its great self by opting for winsome walks. When tired after seeing the bold city, breeze along the waves over Bogatell beach. That surely can ease you and provide you another worth admiring view. If get chance, do play football to your heart's content. 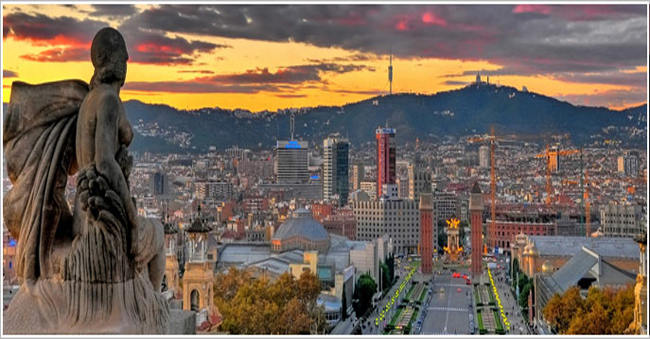 Explore the city Barcelona- a unique blend of ancient antiquity and contemporary charisma.